If a board member resigns or cannot finish his or her term the board of directors must appoint a new board member who serves until the next annual election. The board can continue to the next annual election with less than seven members as long as the remaining number of board members is an odd number. KARE also has non-voting board advisors that are elected by the board of directors. 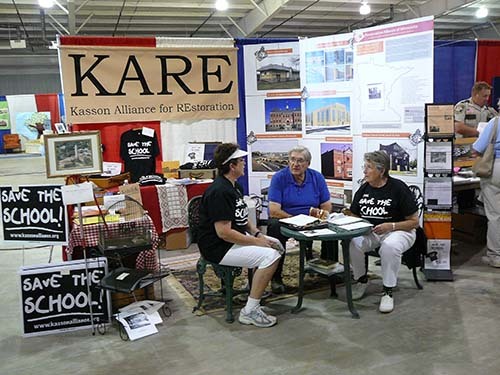 The Kasson Alliance has set up an historic preservation information booth annually since 2007 at the Dodge County Fair. You are welcome to stop by and visit our booth in the Horticulture building. In 2007, KARE President Diane O’Brien-Berge was awarded the Preservation Alliance of Minnesota’s Advocacy Award. The link below contains information about the award. In 2007, the Preservation Alliance of Minnesota (PAM) placed the historic 1918 Kasson Public School on PAM’s 10-Most Endangered Historic Building List. The links below lead to the nomination form and the award brochure (see Page 3). In 2009, KARE was awarded a $2,500 grant from the National Trust for Historic Preservation from the Sweatt Endowed Preservation Services Fund to support expenses related to the 2009 Historic Properties Reuse Study Report that was developed by John Lauber and Company. The links below lead to the nomination form and the award letter. In 2009, KARE was awarded a $5,000 grant from the Rochester Area Foundation from the Kasson-Mantorville Telecom (KMTEL) Donor Advised Fund. 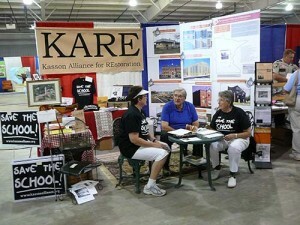 The funds were be used to promote and further KARE’s historic preservation mission. For information on Mantorville, MN’s Marigold Days, please visit their website http://www.marigolddays.com/.